A lot can happen during breakfast. Lately, I’ve been trying to keep breakfast time to just that: breakfast. Just my food and my thoughts. No work, no email, no phone. It’s harder than it sounds, but I’m finding that it lets my brain relax and (often) wander. In this case, my brain wandered to an idea of layered waffle parfait. It was inspired by — you guessed it — a waffle. But that can’t take all the credit; the yogurt sitting right next to my plate also stole my attention. 1. Toast the waffle according to the box’s directions. Or make your own from scratch, if you’re fancy like that. 2. Cut the waffle into pieces. 3. Add a layer of waffle chunks to the bottom of a cup or bowl. I used a wine glass because I’m a real life adult. 4. 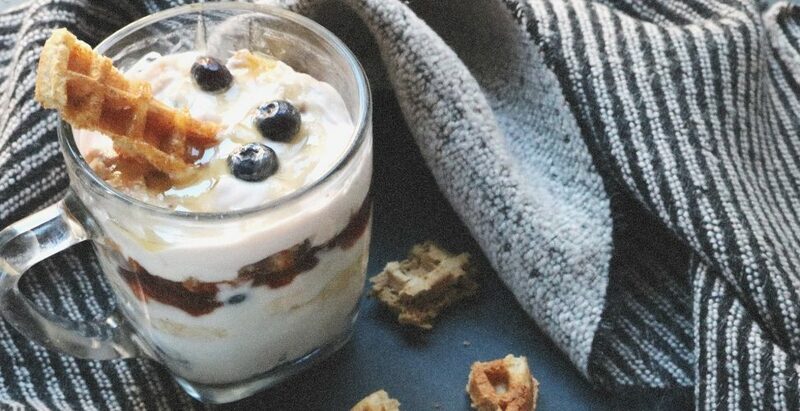 Alternate layers of yogurt, fruits, and jam until you can’t layer no’ more. 5. Eat. All of it.